PHILADELPHIA, PENN. — Early in the afternoon of April 14, society figure Anne Hamilton could be found, improbably, directing traffic on South Broad Street just inside the gates of the Navy Yard. The hard work and can-do spirit exemplified by Hamilton, co-chair with Nancy Kneeland of the Philadelphia Antiques and Art Show, set the tone for the revitalized and renamed fair, literally rebuilt from the ground up by DiSaia-Bittel Management working with an ensemble cast of volunteers, sponsors, exhibitors and the show’s longtime beneficiary, Penn Medicine. The team performed splendidly. Diana H. Bittel Antiques, Bryn Mawr, Penn. The show was handsome and well-balanced, with much to admire and buy. 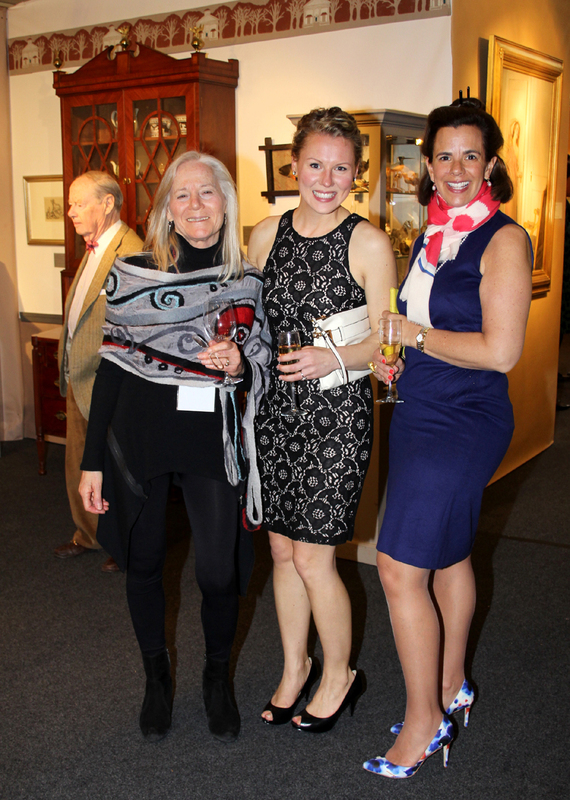 The April 14 preview party was lively and attendance healthy through the fair’s close on April 17. If buyers were slow to purchase, blame the volatile stock market, turbulent election cycle or a host of other trends confounding shows these days. 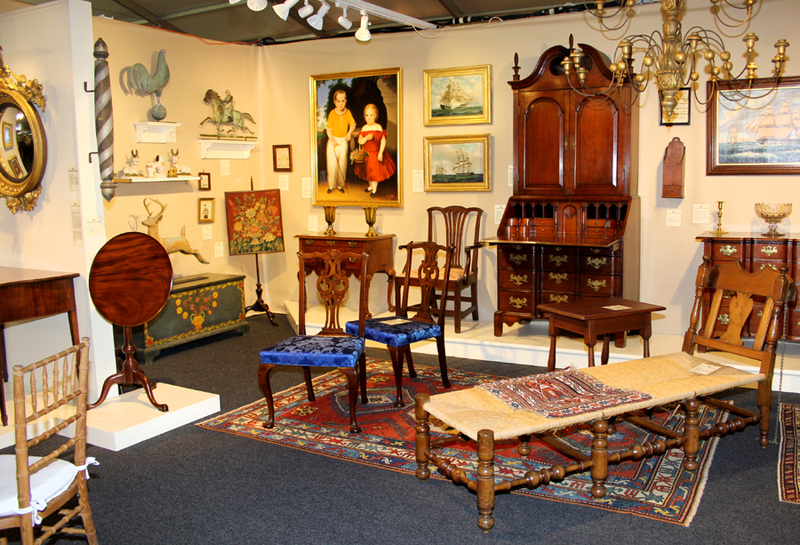 Founded in 1962, the Philadelphia Antiques Show thrived as a model charity event but stumbled after losing its longtime venue, the 33rd Street Armory. It was canceled in early 2015 after losing money at the Pennsylvania Convention Center. Enter Karen and Ralph DiSaia and Diana Bittel. 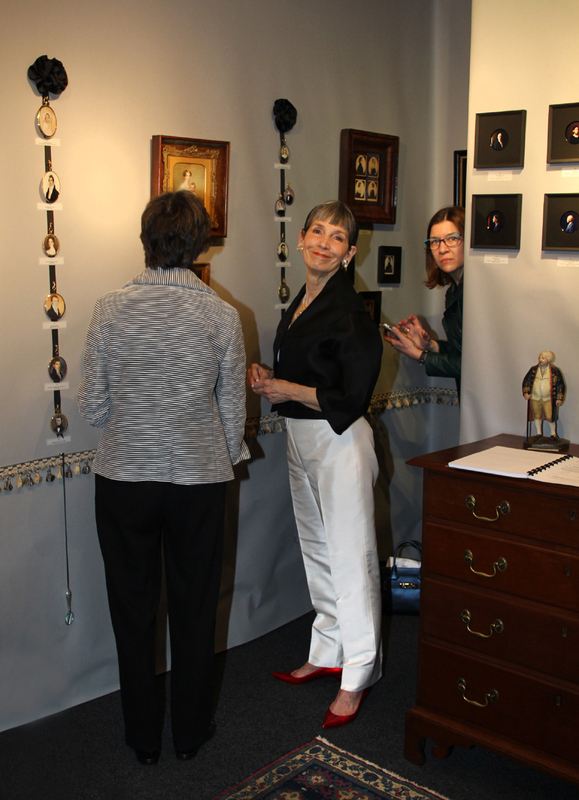 The professional show managers worked around the clock for an entire year to stage the new Philadelphia Antiques and Art Show. They combed the city for possible venues before deciding to erect a massive tent on the parade grounds at the Navy Yard, a prime location undergoing a renaissance of its own. Offering easy parking and pleasant hotel accommodations a short walk from the show, the comfortable, convenient venue got high marks from all but the most determined urbanites, who continue to prefer downtown Philadelphia. 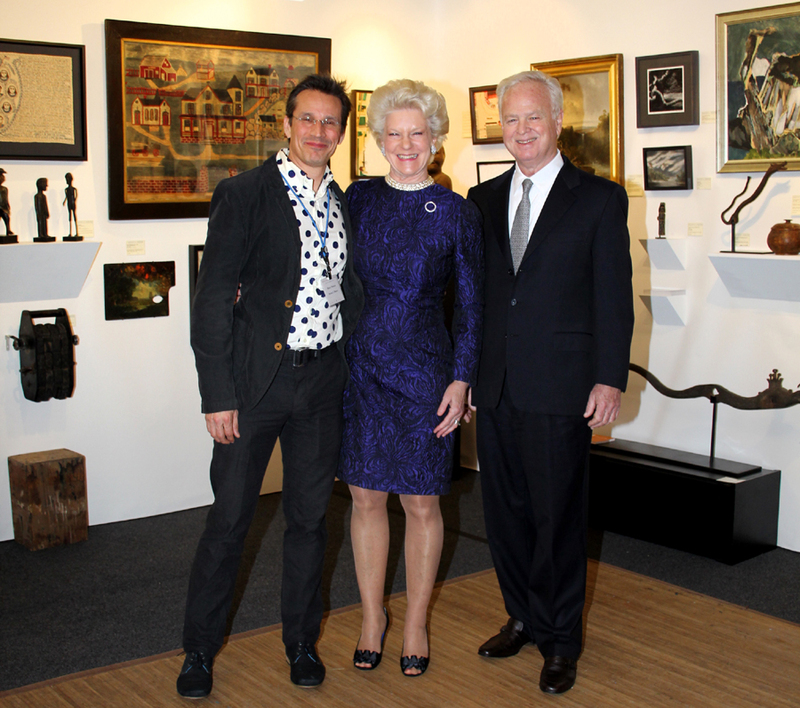 Exhibitor Steve Powers, left, with Nancy Taylor, chairman of the loan show committee, and her husband, Ben. “Everyone stretched to make this work. 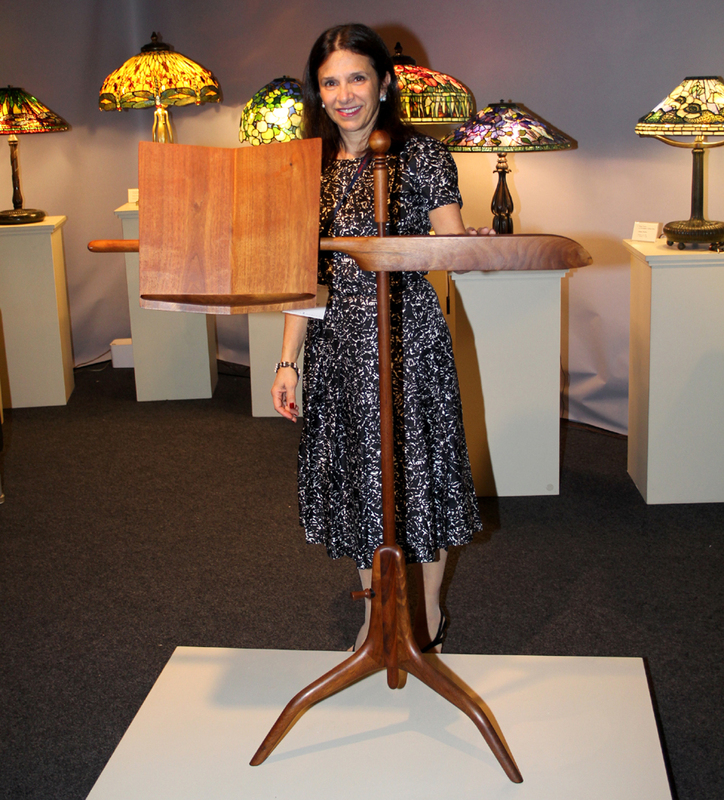 It was a labor of love for us and a lovely vote of confidence that so many great dealers participated,” said Bittel, recalling from childhood the pleasure her father, a collector, had taken in the old show. “We came into this knowing that the show had not been financially viable for a while. Haverford Trust stepped forward with a check allowing us to go forward. They played a huge role getting the new show off the ground. We were all in for less than was spent at the convention center. We did our very best to keep costs low. We had a good advertising campaign. Bus tails were especially effective for us,” said Karen DiSaia. 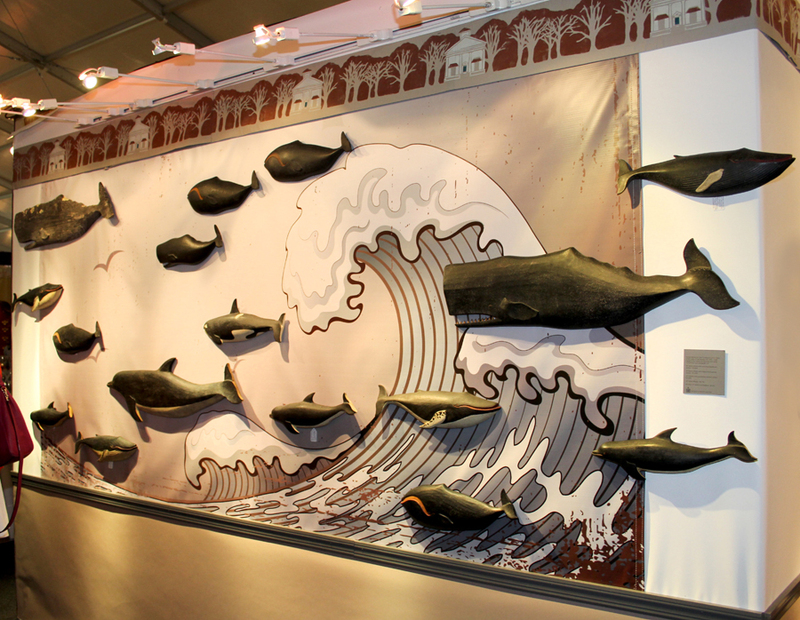 The promoters saved money on the loan exhibition, a lavish production in years past. 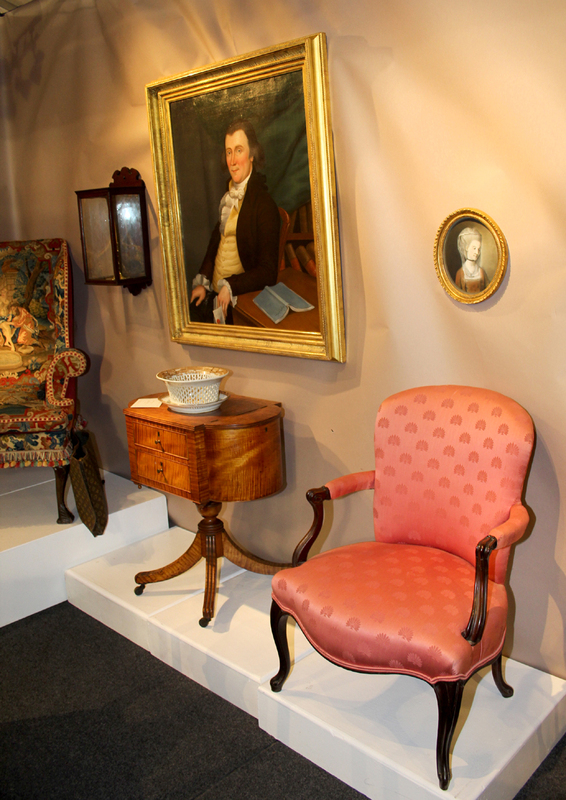 With help from committee chairman Nancy Taylor, Edwin Hild of Olde Hope Antiques selected objects both beautiful and meaningful for “Secret Treasures,” culled from exhibitors’ private collections. Hild’s sensitivity and expertise resulted in a compelling presentation. 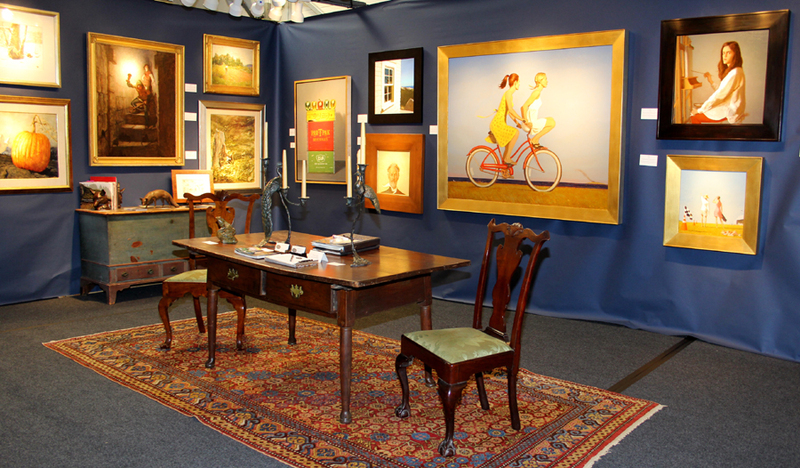 Confirming Olde Hope’s exceptional design skills, Fine Art Connoisseur magazine named the dealer’s own booth best-in-show. Top collectors of Americana were spotted among the roughly 1,200 patrons who attended the opening night party. 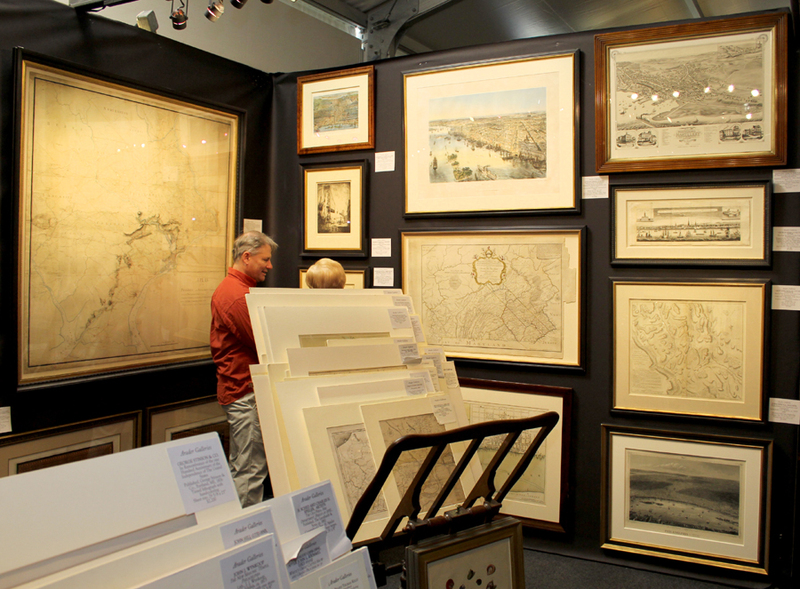 More collectors came Friday, when the show opened to the general public for three days. 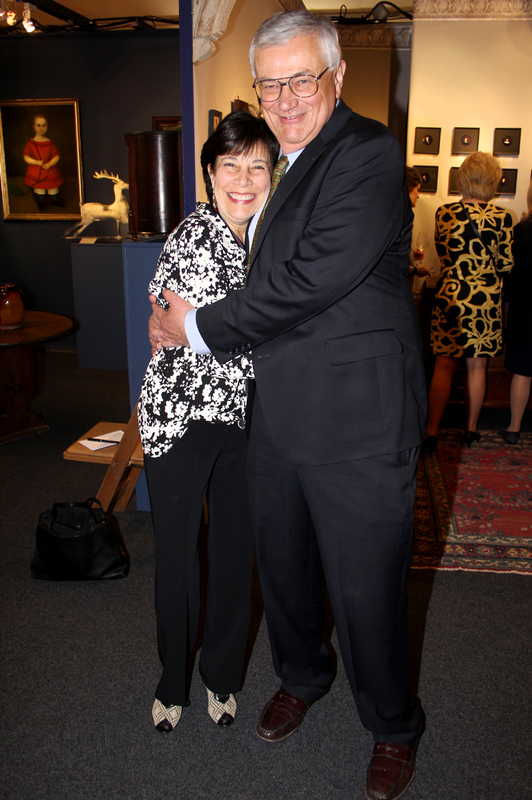 Organized by the Antiques Dealers Association of America, a Friday night dinner honoring Joan and Victor Johnson sold out weeks in advance. Olde Hope Antiques, New Hope, Penn. “The show was better attended than it had been or might have been. The weekend wasn’t mobbed but it was nice, especially given how gorgeous the weather was. 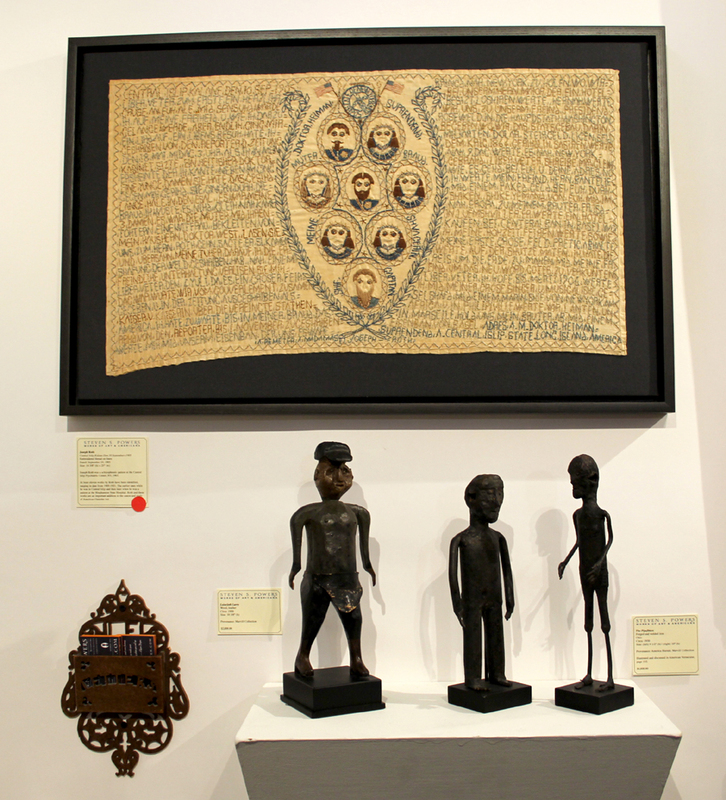 We didn’t think we were having a very good show until we got a phone call yesterday morning, which made it great,” confirmed Philadelphia dealer Amy Finkel, whose sales included a fully worked sampler by Hepsy Neal of Stratham, N.H., circa 1790, and an important Salem, Mass., sampler by Peggy Silver, dated 1797. “We sold some major stuff and met several new people, who also bought,” said Old Saybrook, Conn., needlework authority Carol Huber, also pleased. David Schorsch – Eileen Smiles, Woodbury, Conn. The floor plan evoked the old 33rd Street Armory presentation, with some of the field’s best known specialists — among them C.L. Prickett, Philip H. Bradley, Olde Hope, Schwarz Gallery, H.L. 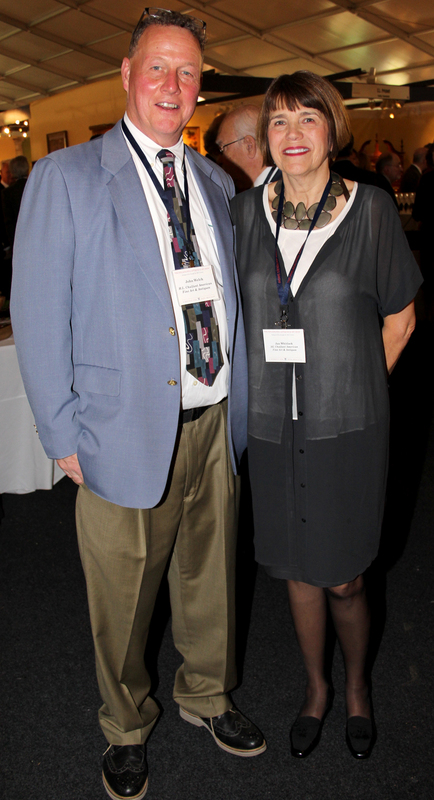 Chalfant and Lillian Nassau LLC — anchoring the center court. “We sold two chairs yesterday as a result of being at the show. Still hoping for more,” said West Chester, Penn., dealer Skip Chalfant, who paired a circa 1730–40 Chester County, Penn., paneled chair with a scalloped crest with a spectacular line and berry inlaid Chester County spice chest of about the same date. “Fairmount Park, Philadelphia” by Nicolino Calyo, 1853, hung over a Federal inlaid mahogany serpentine-front sideboard, possibly Norfolk, Va., circa 1800, at Bernard & S. Dean Levy, Inc., New York City. Folk art collectors Nancy Kollisch and Jeffrey Pressman traveled to the show from Los Angeles and were delighted to acquire from Olde Hope Antiques the charming “Let Love Be Your Guide” pictorial hooked rug designed by James and Mercedes Hutchinson, circa 1925–40. 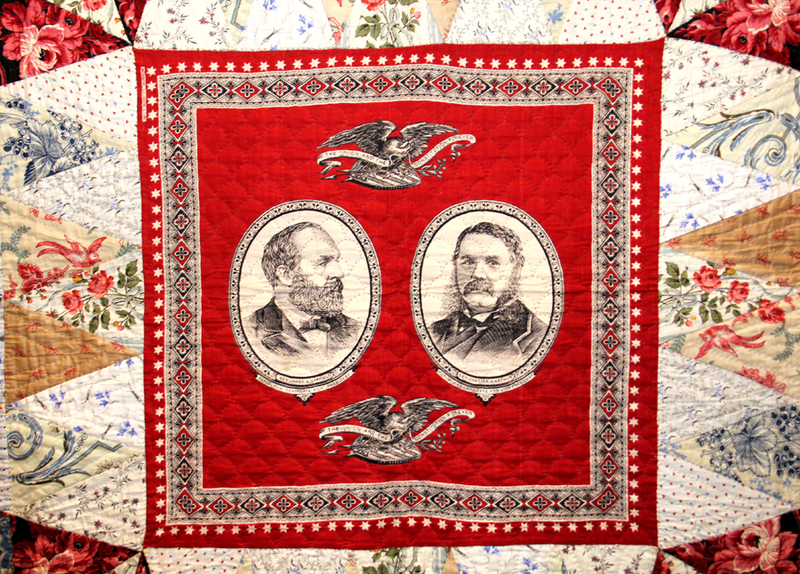 The well-known textile formerly belonged to Burton and Helaine Fendelman. 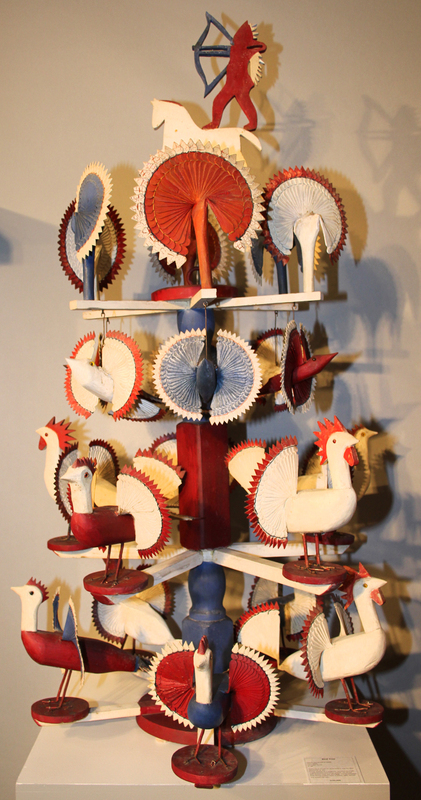 “For us, quite a number of the right people came,” said Olde Hope’s Edwin Hild, who, in addition to the hooked rug, sold smalls, a dome top box by the Compass Artist, a paint decorated dressing table in vibrant yellow and a large Jewell weathervane. H.L. 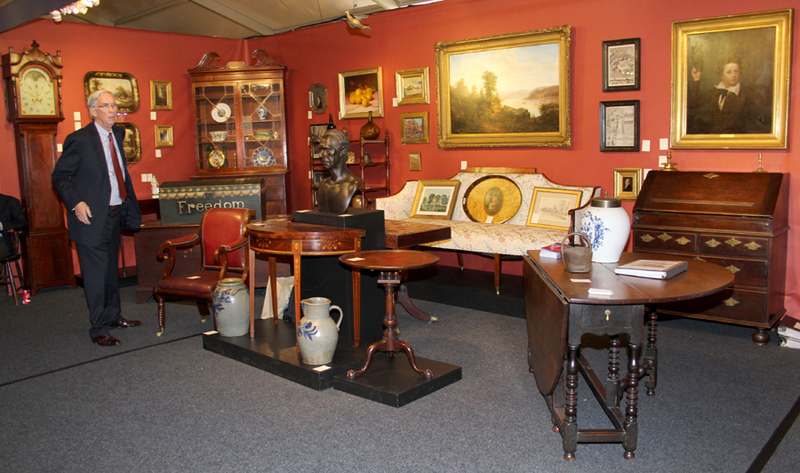 Chalfant American Art and Antiques, West Chester, Penn. 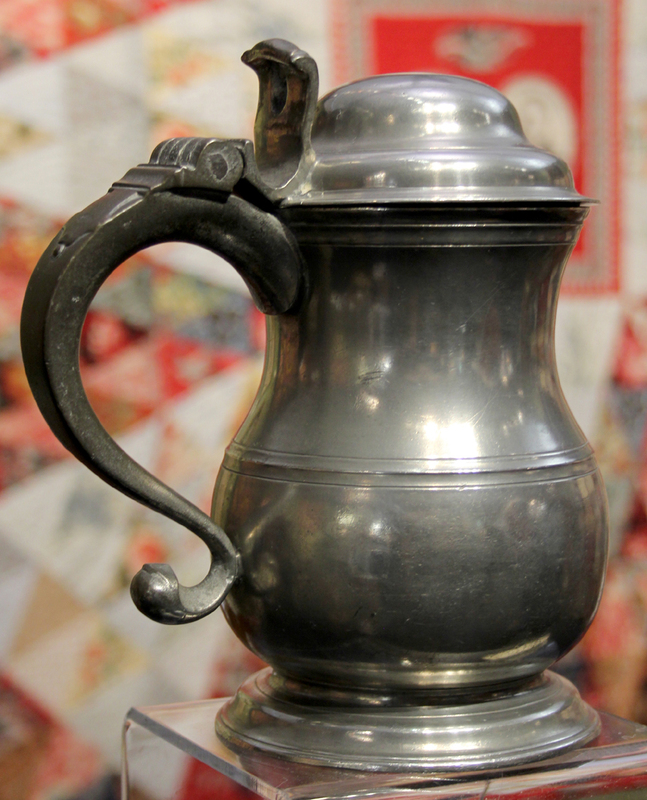 Experts in Pennsylvania German pewter and textiles, Lancaster, Penn., dealers Don and Trish Herr pulled out all the stops for the final show of their career. “It was a nice way to end. 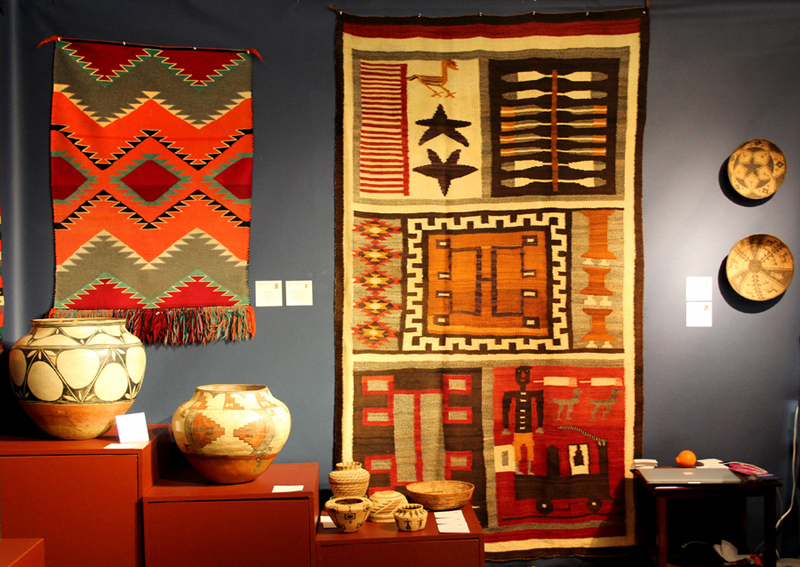 We sold three major quilts, a Heyne pewter chalice and Parks Boyd pewter creamer, decorated hand towels, baskets, coverlets and even one coverlet that we could have sold twice,” reported Trish, who looks forward to doing more shopping and less packing in the days to come. 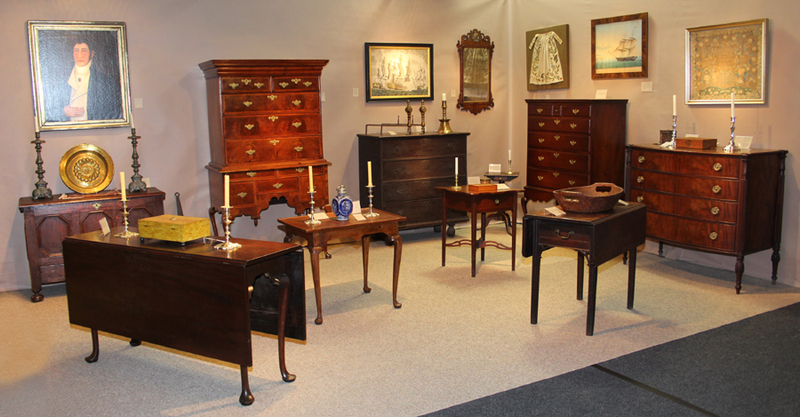 “I sold a Massachusetts highboy and a Pennsylvania painted box in the last hours of the show. 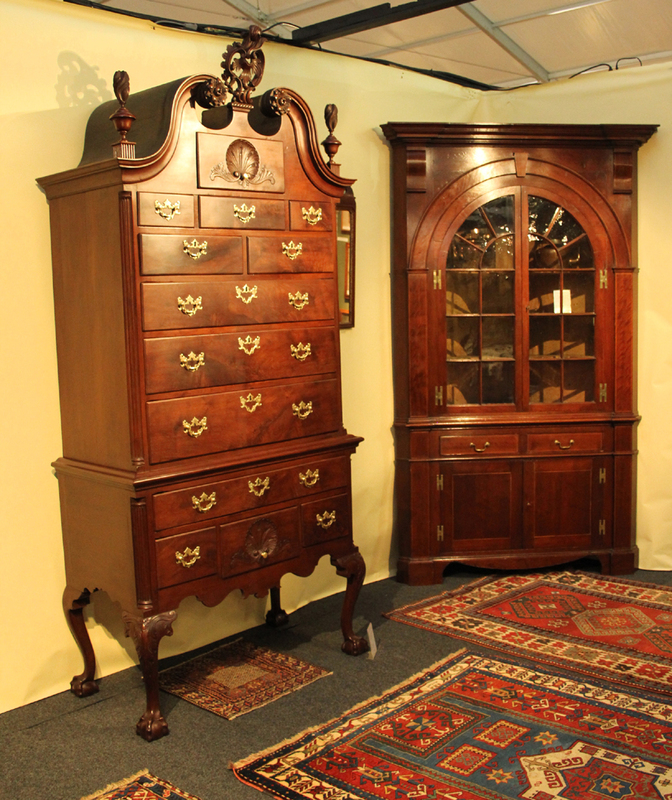 The mystery buyer from Texas was a big help for many of us,” said New Oxford, Penn., dealer Kelly Kinzle, referring to a customer who bought by phone via Diana Bittel, who circled the room describing pieces to the caller. A major sale for Carlisle, Penn., dealer James L. Price was a circa 1765 Philadelphia high chest with carving by Martin Jugiez. 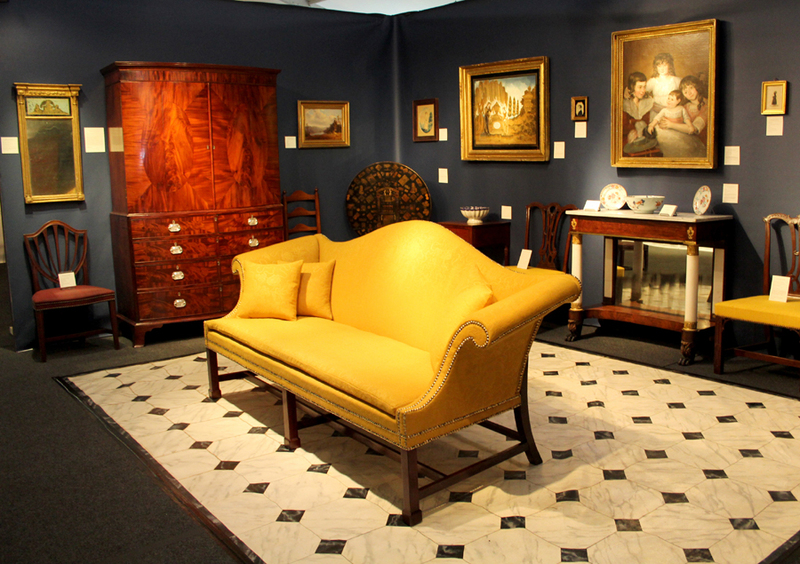 Christopher Rebollo showcased a striking Philadelphia Chippendale mahogany Marlborough sofa, circa 1765–85, covered in stunning handmade reproduction watered wool by Eaton Hill Textile Works of Marshfield, Vt. 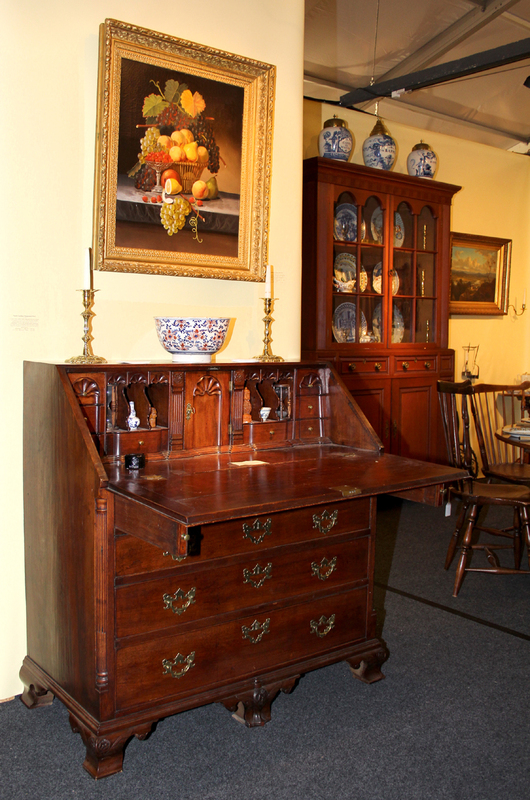 The North Wales, Penn., dealer sold chairs, a painting, a looking glass and a notable Philadelphia clothes press, apparently a match to a chest published in Horner’s Blue Book of Philadelphia Furniture. “I had a good show. 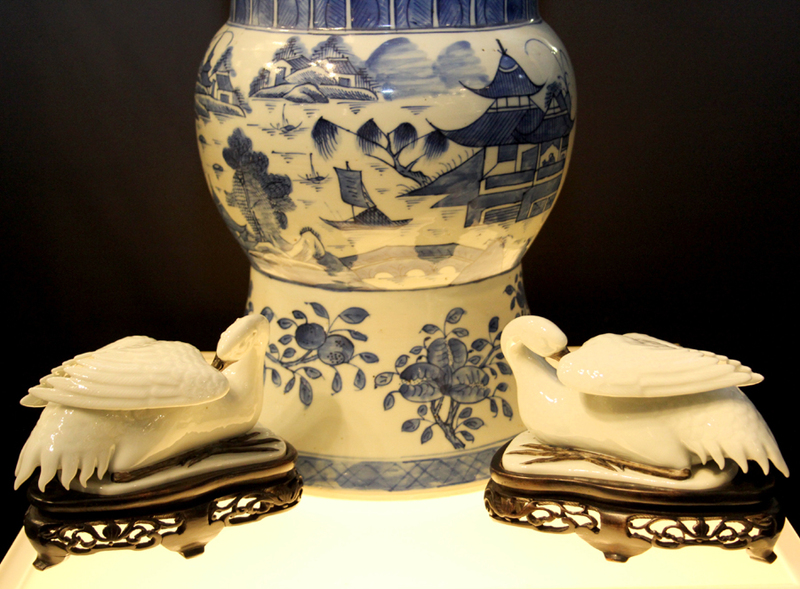 I brought 40 sales slips and used 36 of them, ” said New Hampshire dealer Mark Allen, whose sales included a set of Windsor chairs and three delft bowls. 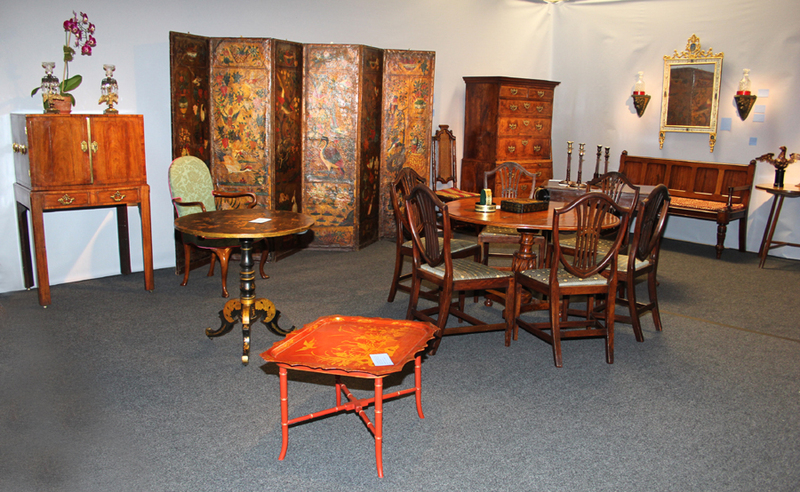 Furniture did well for Sumpter Priddy, Arthur Liverant and Jeffrey Tillou. Priddy parted with a Philadelphia demilune card table, a Maryland blanket chest inlaid with the date “1777” and a circa 1710 Virginia gate leg table. 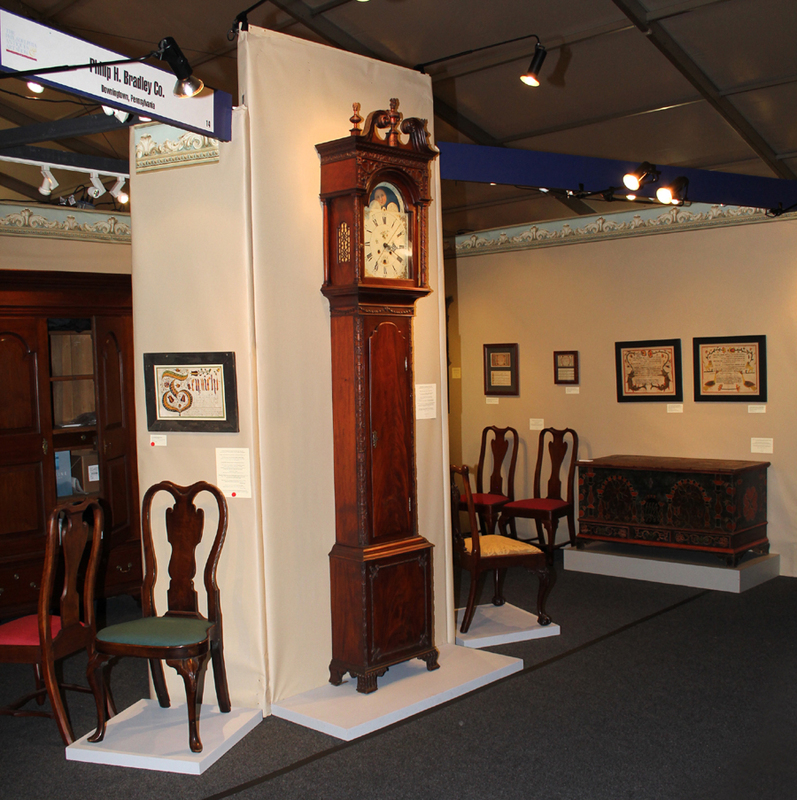 Eaton wrote up a John Bailey tall clock and a Queen Anne dining table. Tillou sold three pieces of furniture, three good weathervanes and a few paintings. Don Cresswell, Philadelphia Print Shop, Philadelphia, Penn. “The show surpassed expectation. Accolades go to DiSaia-Bittel and the committee for putting it together,” said Liverant, who parted with a handsome pair of cherry side chairs attributed to Eliphalet Chapin, East Windsor, Conn., circa 1765–85, and a Massachusetts powder horn dated 1732. 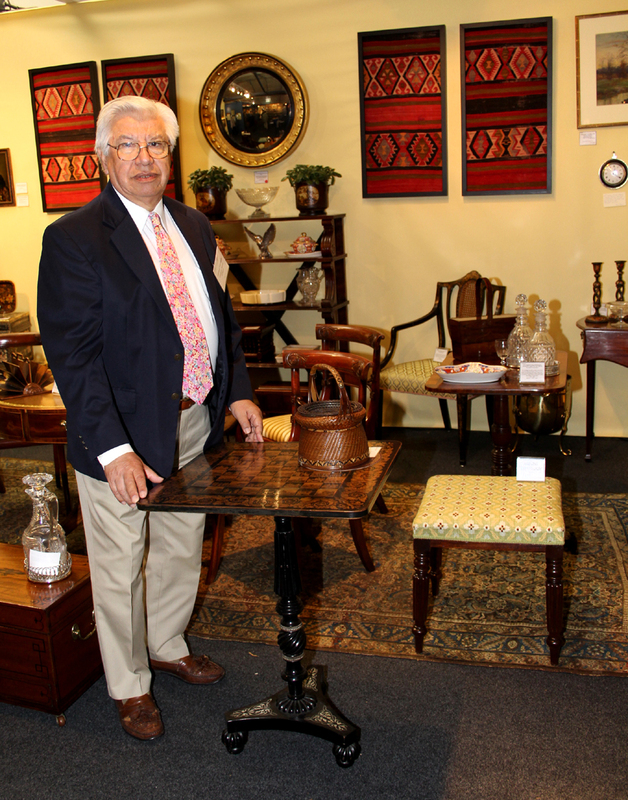 Frank Levy built his booth around a carved Federal mantel that had once been in his grandfather Bernard Levy’s house. 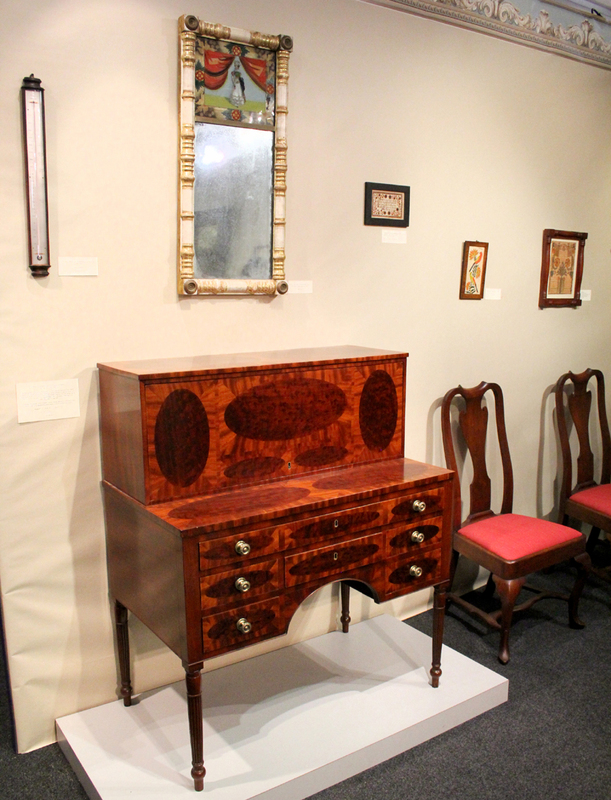 A rare Fairmount Park, Philadelphia, view by Nicolino Calyo hung over a Federal inlaid mahogany serpentine front sideboard, possibly from Norfolk, Va.
“I have serious interest in the mantel and a collector I met at the show came into the shop yesterday and bought a set of chairs,” Levy said from his Manhattan gallery after the fair. 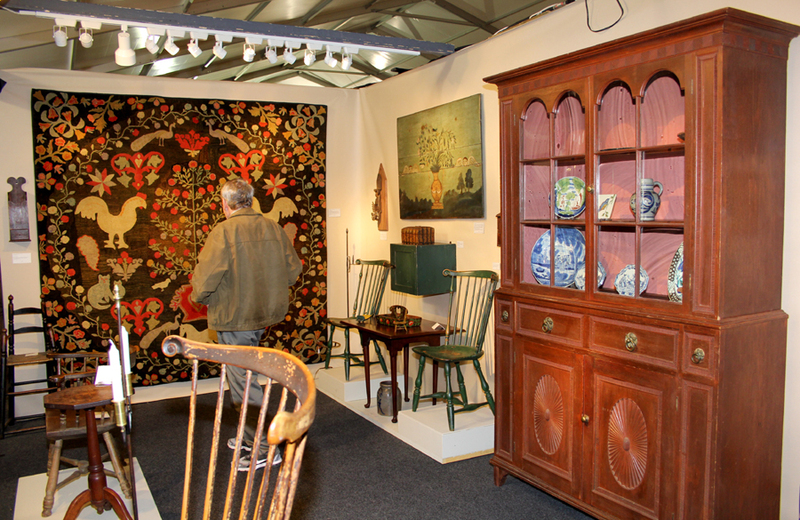 Specializing in English furniture, Philip Colleck, Ltd, reserved a Queen Anne chinoiserie painted screen and an Anglo Indian circular satinwood breakfast table. 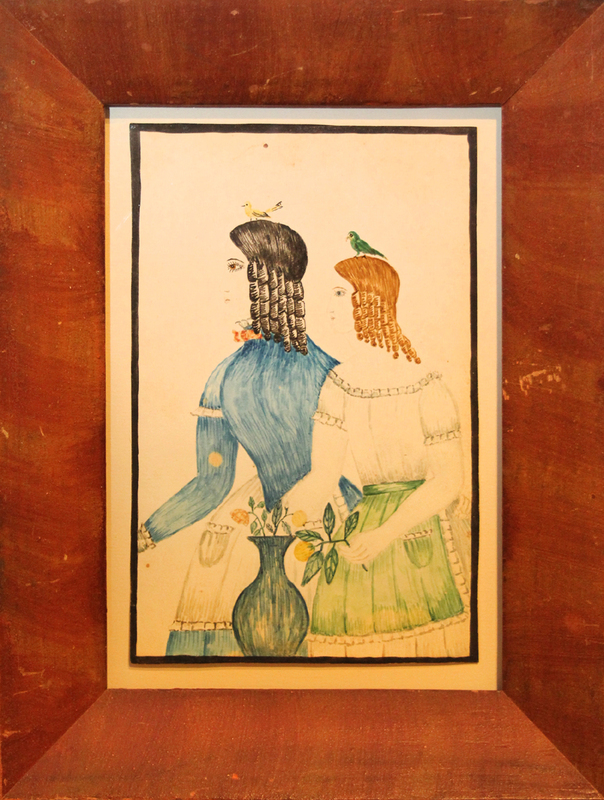 “I sold two watercolors and my Bertolet family grain painted tall clock. 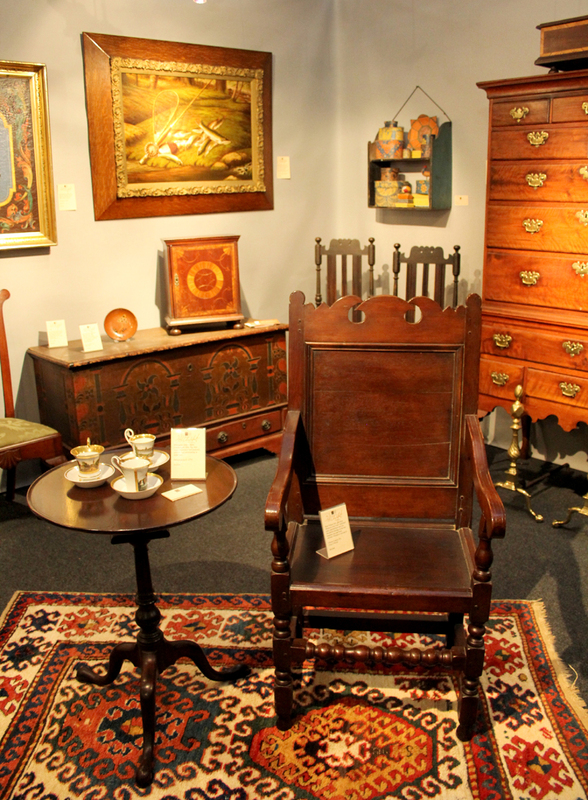 I purchased an important Schwenkfelder Vorschrift and a compass-seat Philadelphia side chair from Philip Bradley,” said David Schorsch, the Connecticut-based dealer known for American folk art. 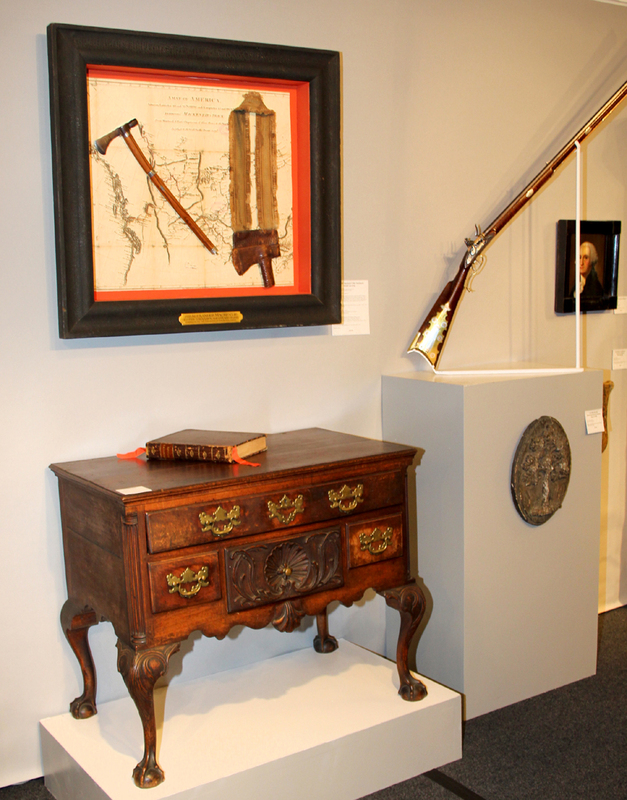 Naval art and artifacts expert James L. Kochan wrote up two Federal-era silver-hilted swords, both by Philadelphia artisans, on opening night. 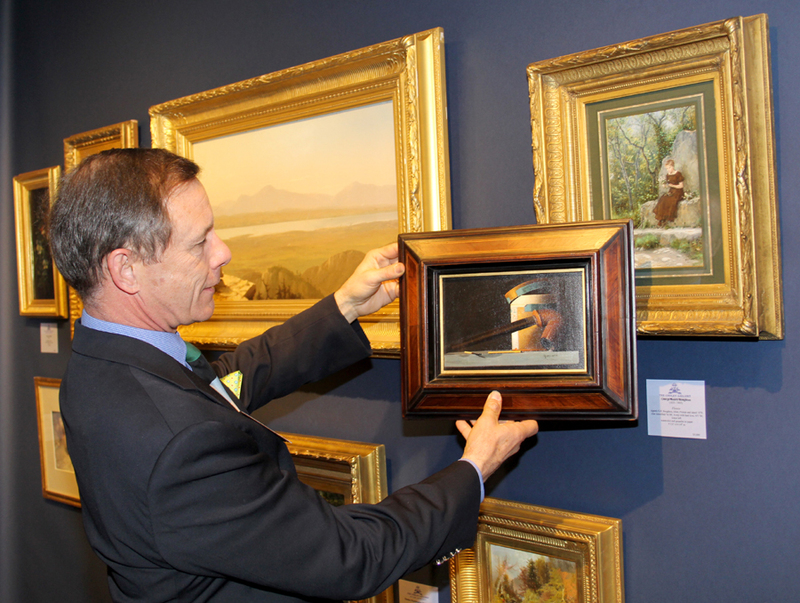 On Sunday, a couple returned to the show to purchase “Fishing on The Grand Banks” by Anton Otto Fischer, 1938, from the Maryland dealer. Christopher T. Rebollo, North Wales, Penn. 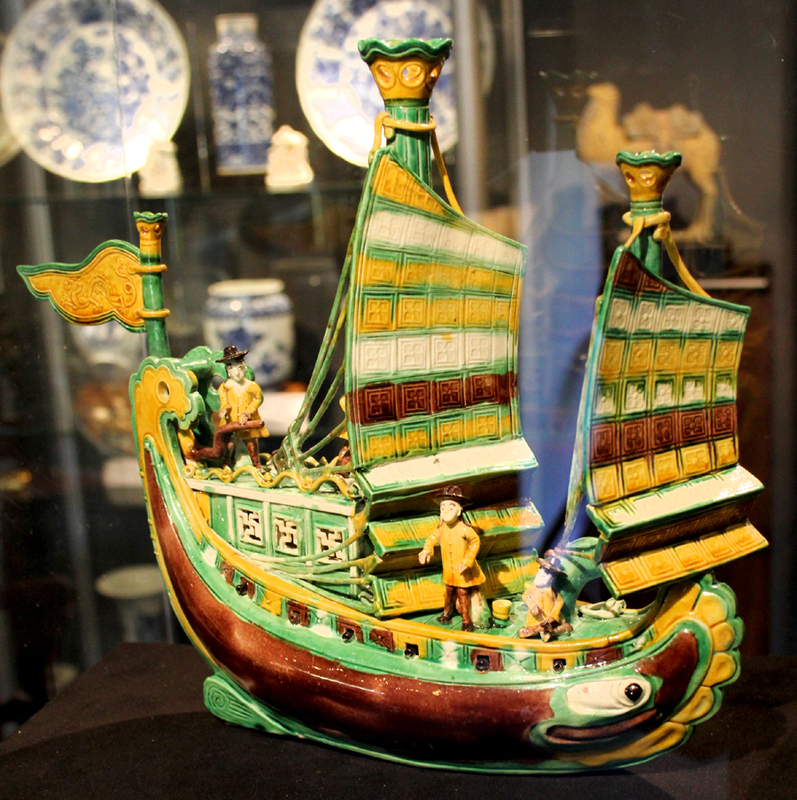 “We sold some good early American silver and several fine pieces of jewelry,” said Timothy Martin of S.J. Shrubsole. 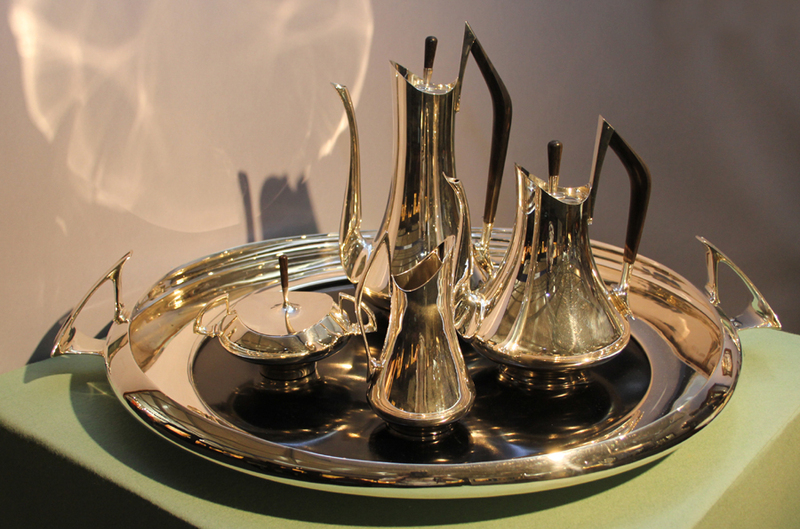 Silver specialist Spencer-Marks reported sales of a rare Kirk repousse centerpiece with original glass liner, a Gorham “Chicken Leg” coin-silver teapot and a figural ladle. “A major institution is considering an extremely rare Gorham sterling and enamel tea set and we are anticipating the sale of a pair of tureens,” confirmed Mark McHugh. 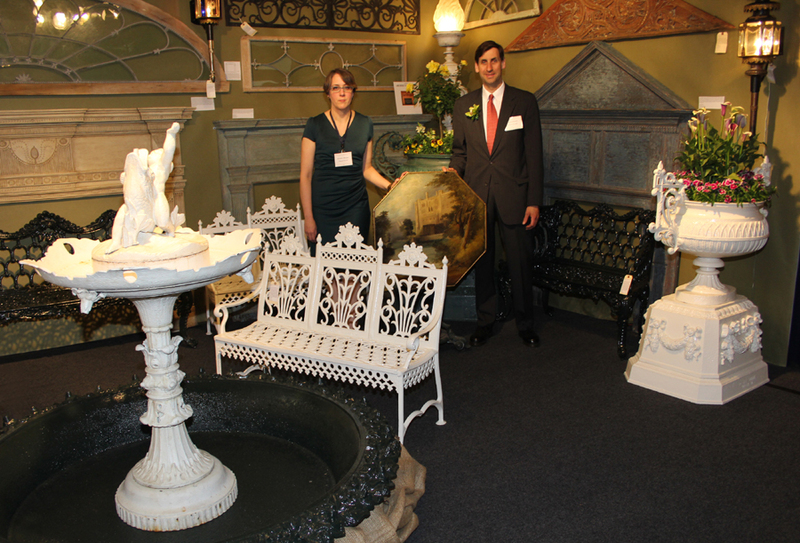 With spring in the air, garden antiques specialist Francis Purcell showed an 1860 English painted cast iron tilt-top table, cast iron settees, a Carron bench akin to one in the Kennedy White House and a Robert Wood of Philadelphia fountain. Jennifer Morgan and Francis Purcell, Francis J. Purcell, Philadelphia. 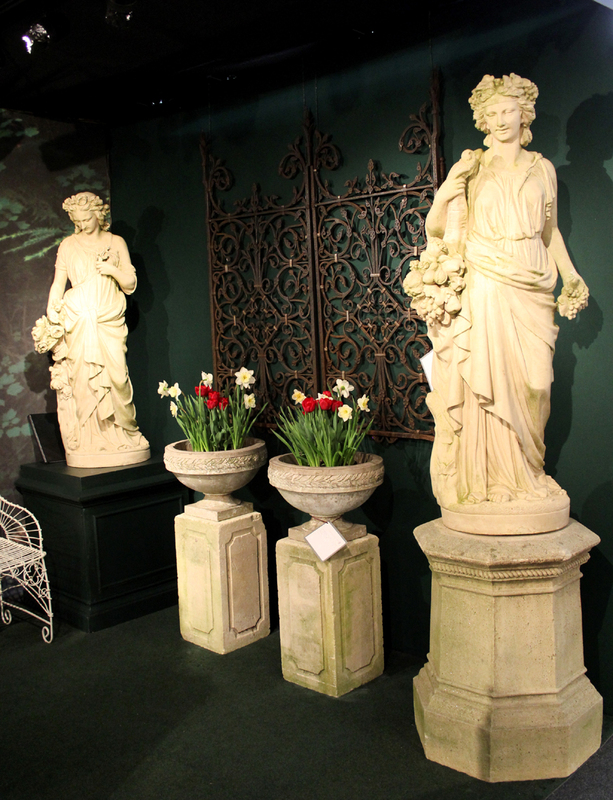 Barbara Israel sold a rare pair of lead figures representing summer and spring, both signed Bromsgrove Guild, English, circa 1910, ex-Richard Mellon Scaife; a console table, a pair of Galloway terracotta planters and a French terracotta griffin. 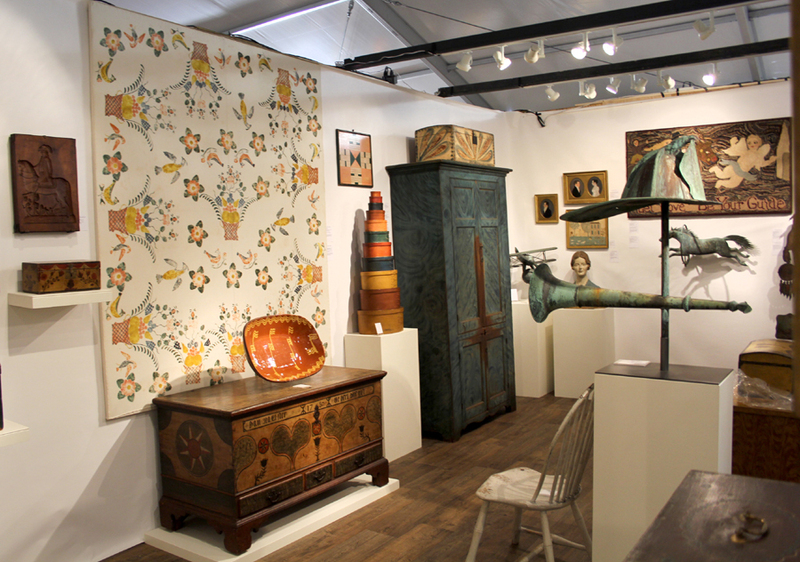 In the modern and contemporary realm, Lillian Nassau LLC featured a walnut music stand by Sam Maloof, Peter Pap showed mid-Twentieth Century Swedish carpets by the Marta Maas Fjetterstrom Workshop and Brooklyn, N.Y., dealer Steven S. Powers parted with early Twentieth Century embroideries by the Outsider artist Joseph Roth, a psychiatric patient at Central Islip and Binghamton State Hospitals. Philip H. Bradley. Downingtown, Penn. With a few exceptions, paintings dealers struggled. 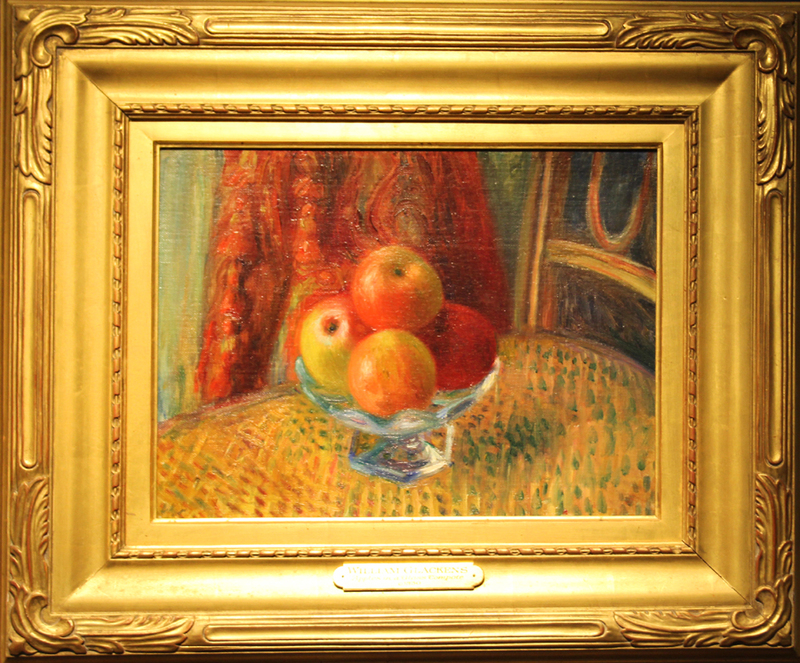 “We sold only one small painting,” said Robert Schwarz of the Schwarz Gallery, a Philadelphia mainstay. “I sold well enough, but it wasn’t a blockbuster,” noted portrait miniatures specialist Elle Shushan. 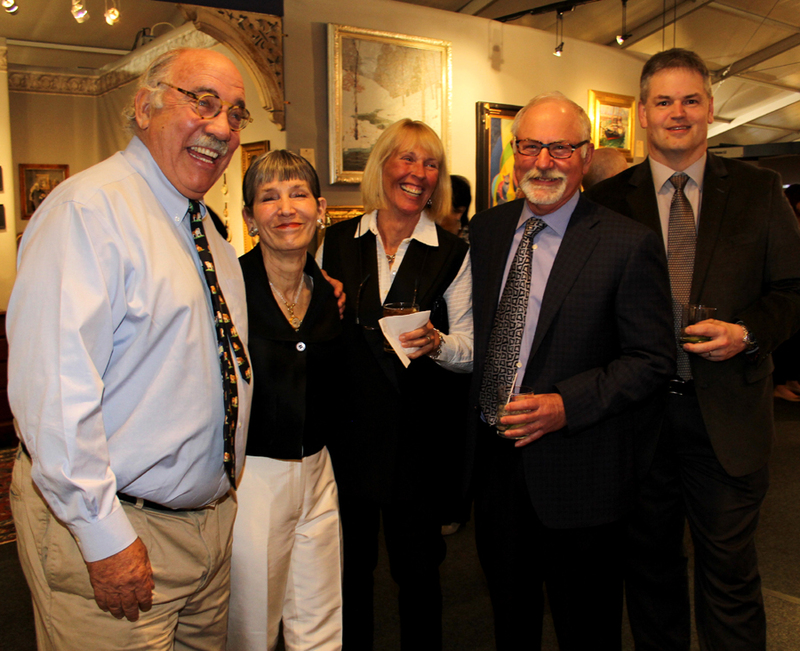 “The show looked excellent and visitors found it easy to get here,” said Ellery H. Kurtz of Godel & Co., Fine Art, which offered folk portraits by Ammi Phillips alongside trompe l’oeil paintings by John F. Peto and Victor Dubreuil. American art specialist Jeffrey Cooley devoted one wall to Impressionism, another to Hudson River School canvases and a third wall to contemporary paintings with paper by Joan Brownstein. 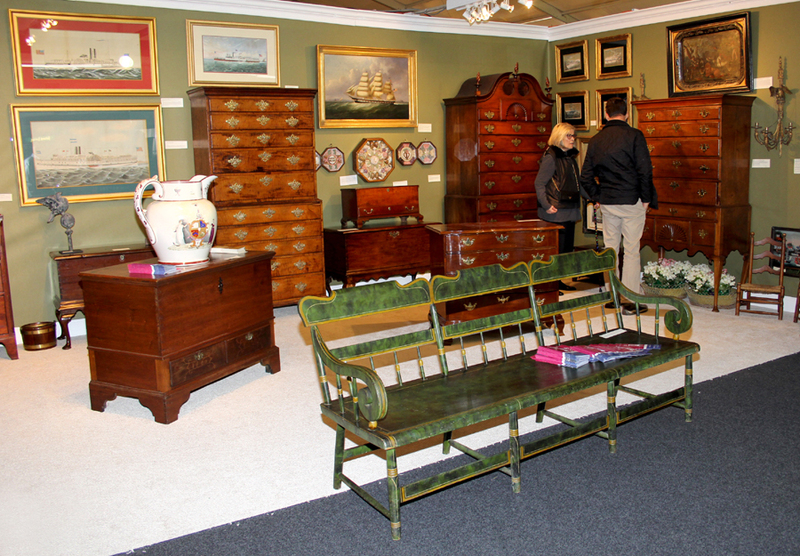 The Old Lyme, Conn., dealer divided his dozen or so sales between old and new pieces. 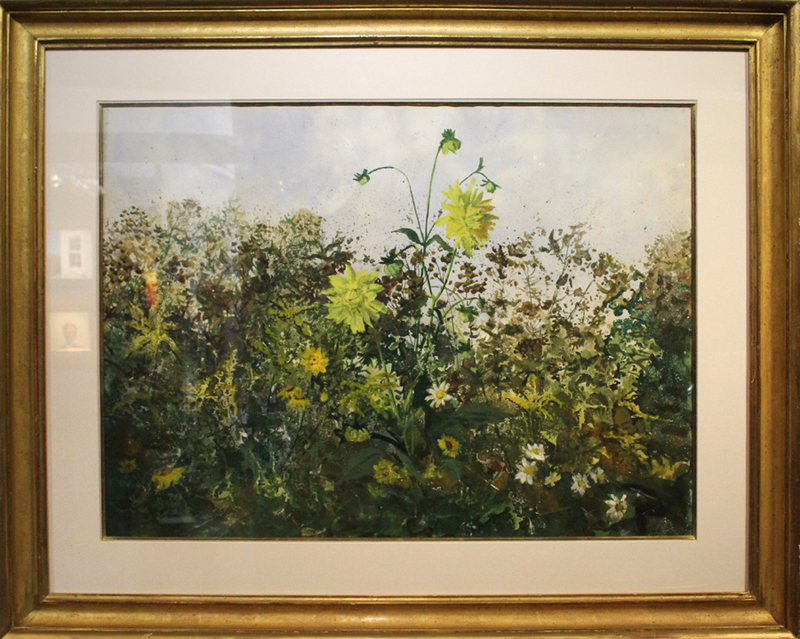 Newburyport, Mass., dealer Peter Clarke of the Clarke Gallery sold four paintings by Karin White plus pieces by John Singer Sargent, Hugh Bolton Jones and Milton Avery. Penn Medicine has every reason to be elated by the DiSaia-Bittel effort. 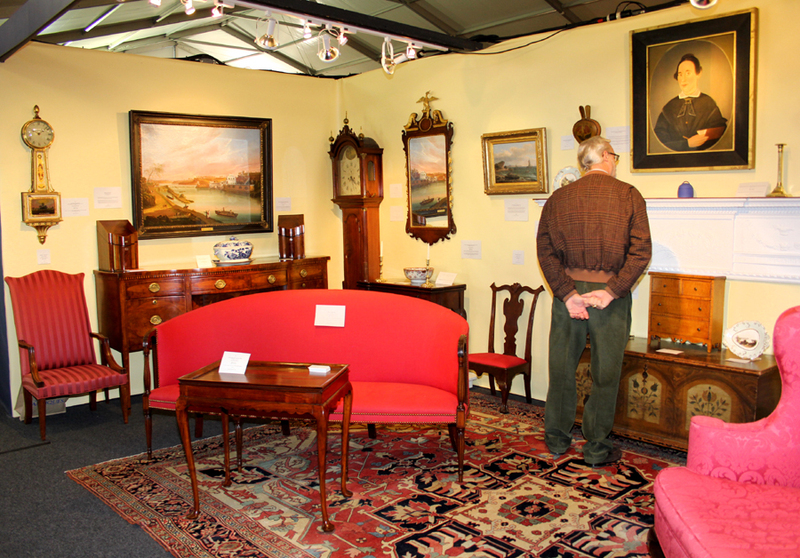 With a bit more selling, exhibitors will be unreservedly delighted with the show, as well. 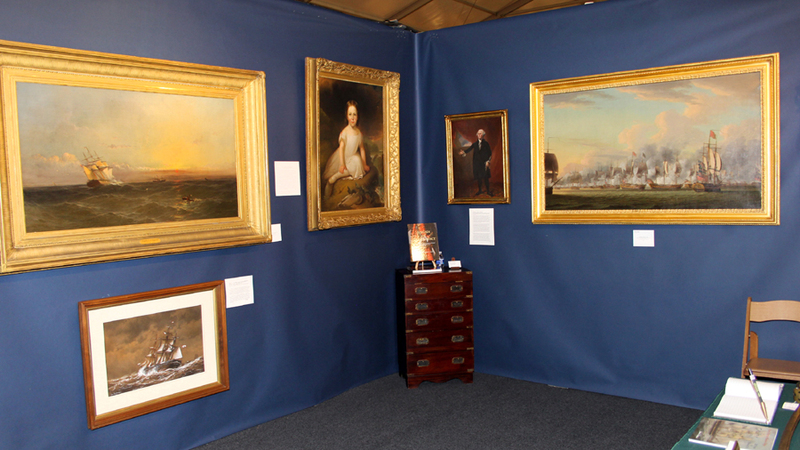 Promoting Philadelphia as a destination, persuading more collectors from outside the region to travel to the area, and attracting and developing younger buyers is essential for the fair’s success, as it is for all top-drawer shows these days. 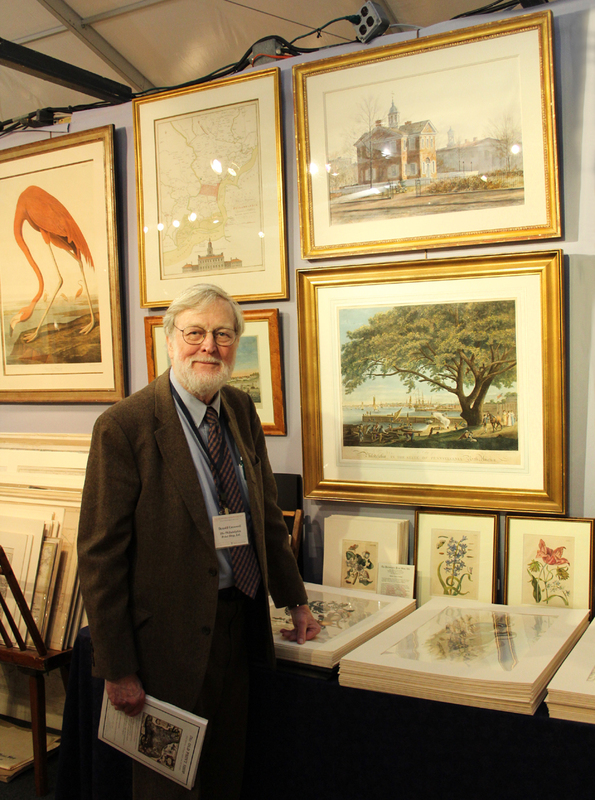 Don Cresswell of the Philadelphia Print Shop reported selling to a newlywed couple three historical landscape prints depicting Rittenhouse Square, where the couple lives. Of such acorns mighty oaks grow. 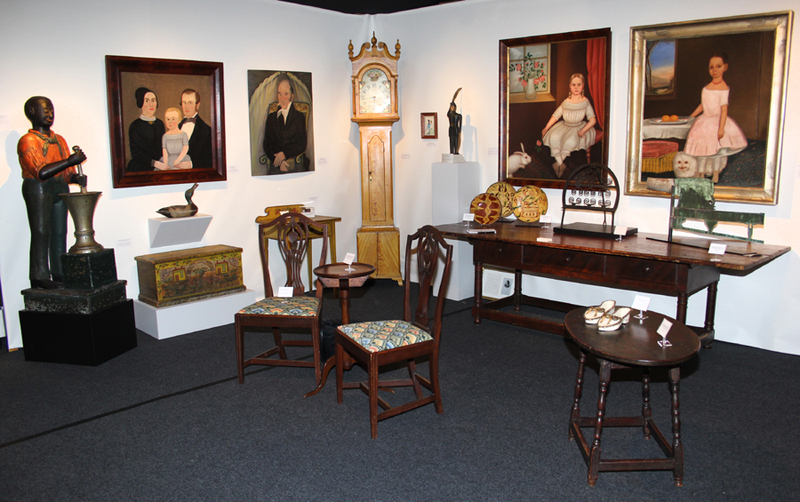 For additional information, www.philadelphiaantiquesandartshow.com or 610-902-2109. 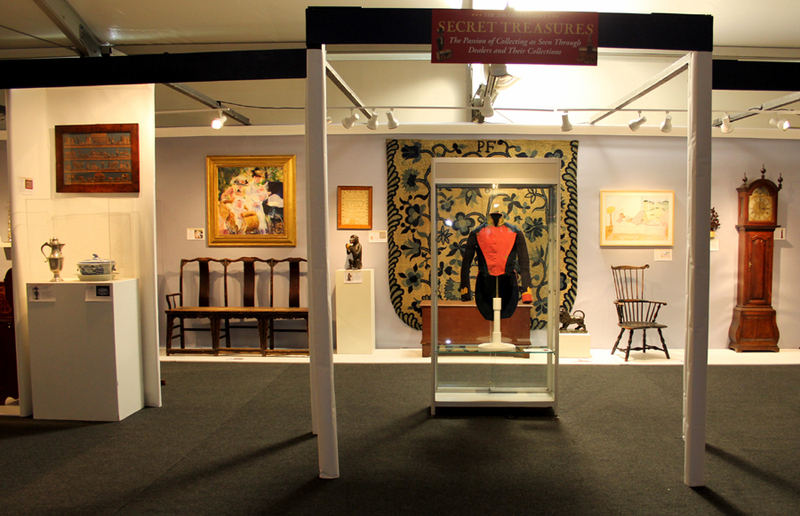 Organized by Edwin Hild and Nancy Taylor, the loan show “Secret Treasures” offered a thoughtful, entertaining introduction to the show’s 58 exhibitors. Kelly Kinzle, New Oxford, Penn. 12 by 15 inches. 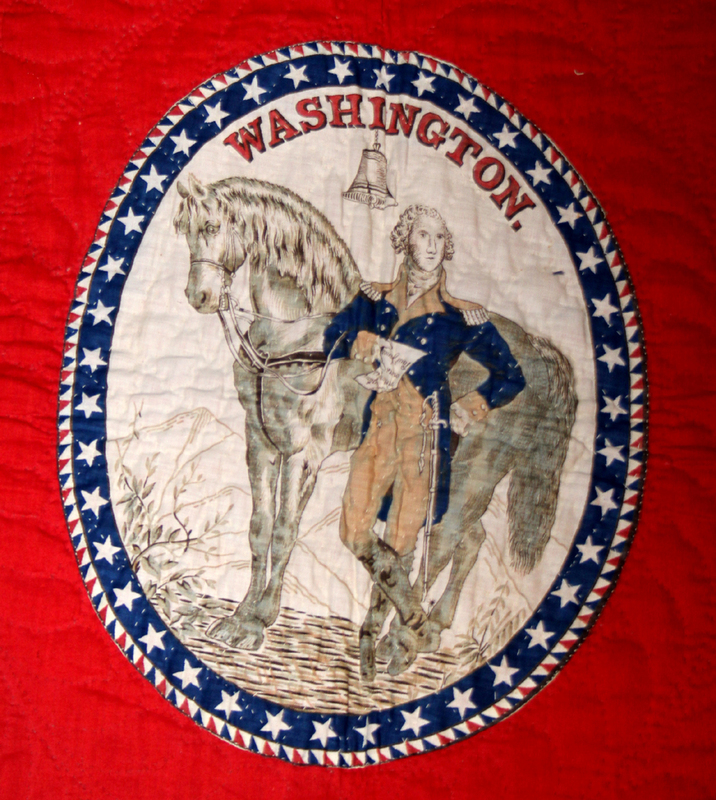 William Vareika Fine Arts, Newport, R.I.
Quilt detail, The Herrs Antiques, Lancaster, Penn. The Herrs Antiques, Lancaster, Penn. 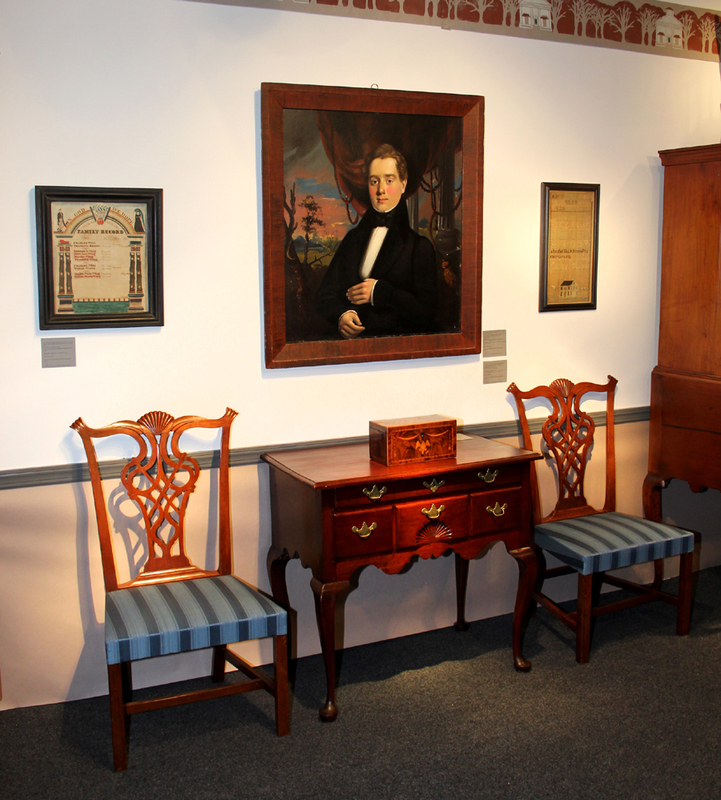 James L. Kochan Fine Art and Antiques, Frederick, Md. Somerville Manning Gallery, Greenville, Del. “Sansom, Golden Retriever” by Eric Berg, bronze, edition 5/5. 22 by 30 inches. John Chaski, Camden, Del. 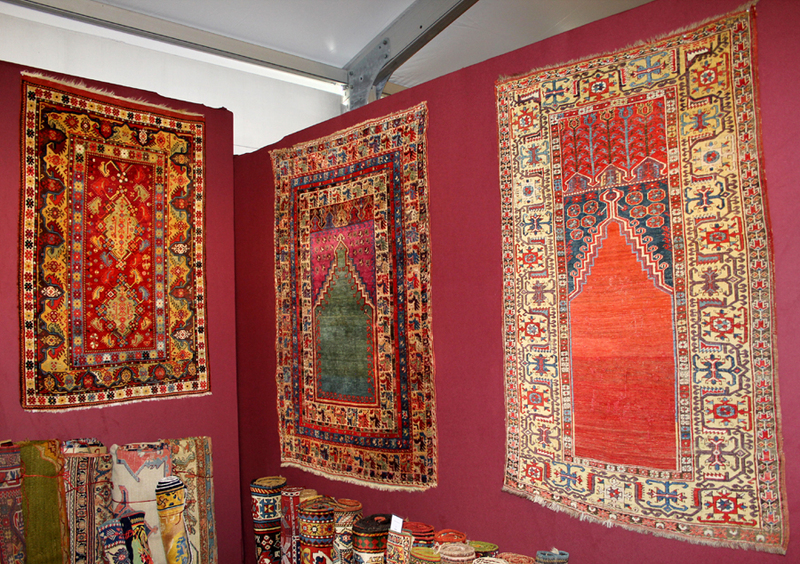 Peter Pap Oriental Rugs, Inc., San Francisco, Calif., and Dublin, N.H.
James L. Price, Carlisle, Penn. 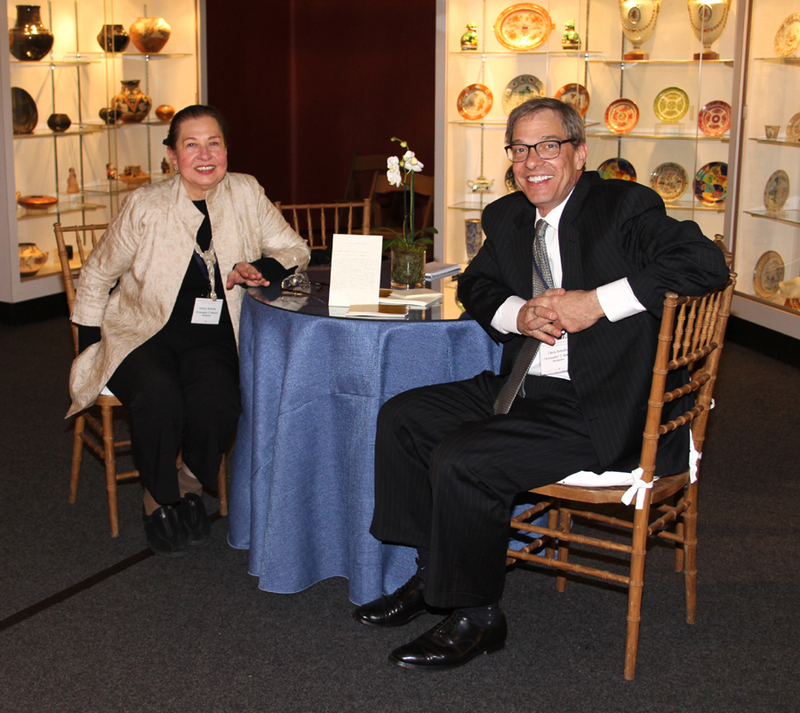 Gemini Antiques Ltd., Oldwick, N.J.
Audrey Rebollo and Chris Rebollo wait for the preview party to begin. Philip Suval, Inc., Fredericksburg, Va.
Mark and Marjorie Allen, Gilford, N.H.
Steven S. Powers, Brooklyn, N.Y.
Pewter tulip-shaped tankard attributed to Johann Philip Alberti, Philadelphia, working 1754-1780. The Herrs, Lancaster, Penn. but will still deal by chance and appointment. 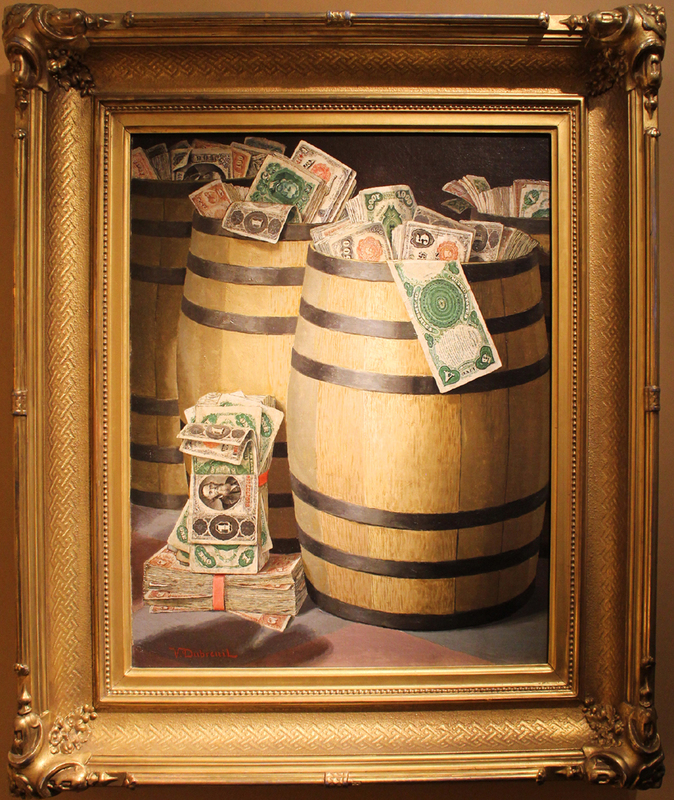 ‘Bundles of Money’ by Victor Dubreuil. Godel & Co., Fine Art, New York City. 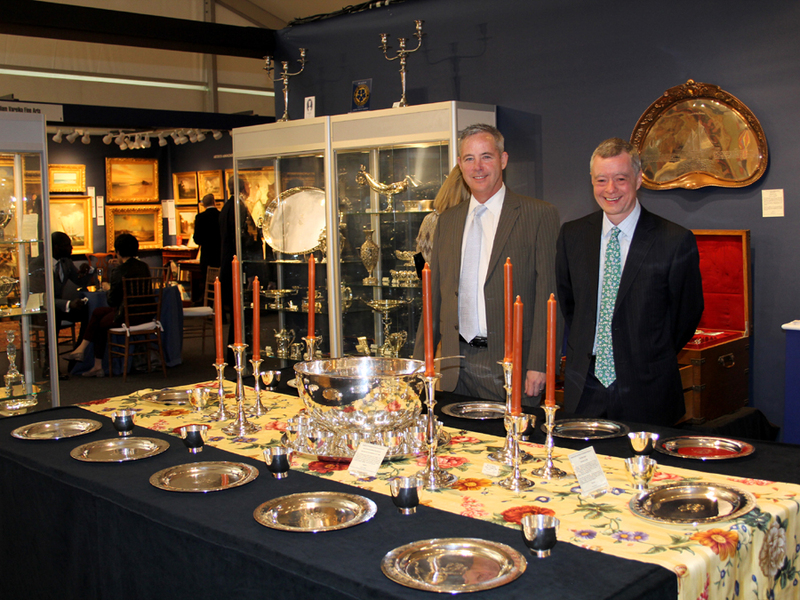 Mark McHugh and Spencer Gordon of Spencer Marks Ltd. set their table with a Kalo Shop presentation service for 12 and a circa 1950 Allan Adler and Porter Blanchard hand-wrought punch service. 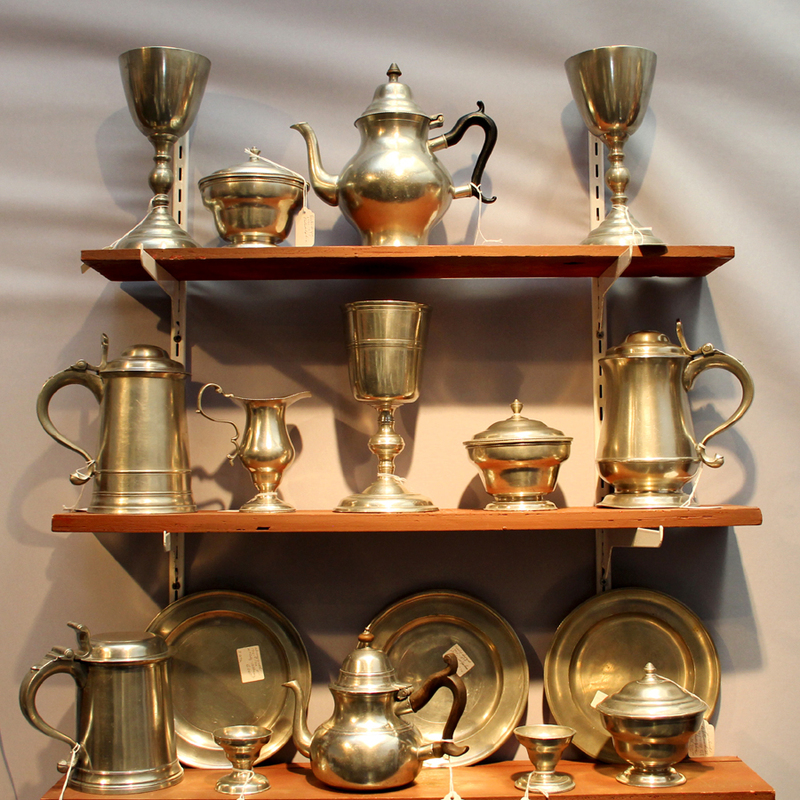 Above right, an 1889 Gorham silver and mixed metals fancy waiter custom ordered by Jesse H. Metcalf, co-owner of the yacht Sachem, designed by Edward Bu8rgess and built by Lawley & Son. Gigi Liverant, left, greets the Philadelphia Museum of Art’s Gina Guzzon and Alexandra Kirtley. 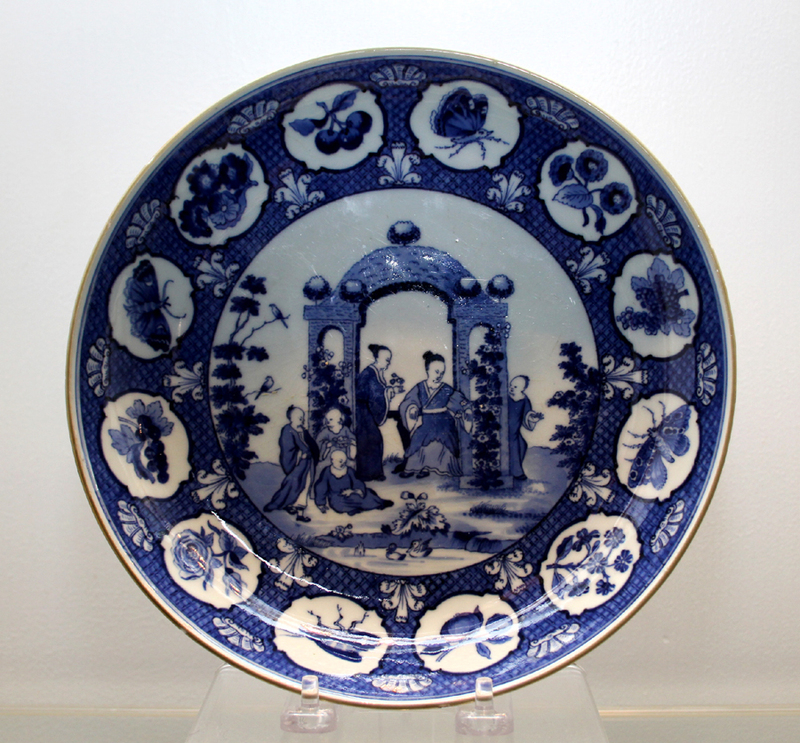 Guzzon is a research assistant in the museum’s department of American decorative arts. 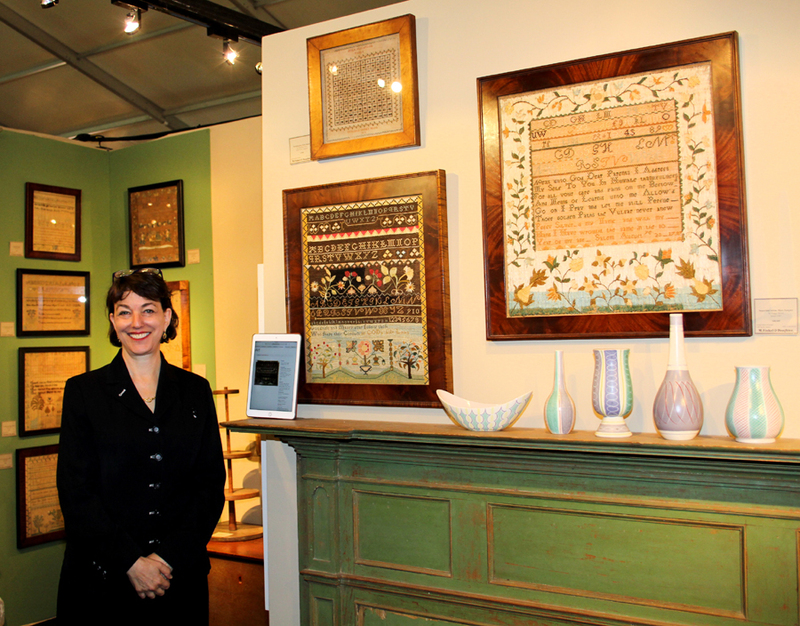 Kirtley, right, is the museum’s Montgomery-Garvan Curator of American Decorative Arts. auctioneer Ron Bourgeault, her former employer. Nathan Liverant and Son, Colchester, Conn.
Elliot F. Clark of Maine is attributed to William M. Prior, 1835-40.
offered works old and new in several mediums. 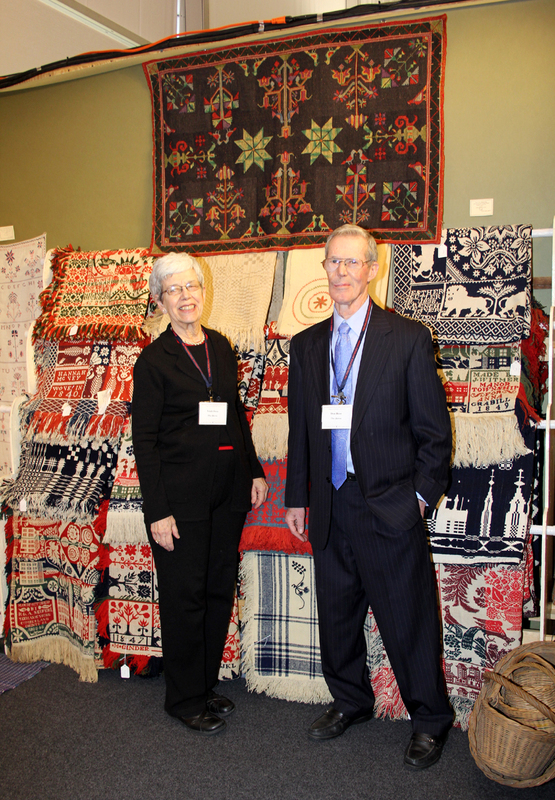 John Welch and Jan Whitlock assisted customers in Chalfant’s booth. Left and center, Ron and Debbie Ron of Pook & Pook Inc., with, right, Steve Fletcher and Chris Fox of Skinner Inc. Exhibitor Ellie Shushan is second from left. who made this walnut music stand in 1968. 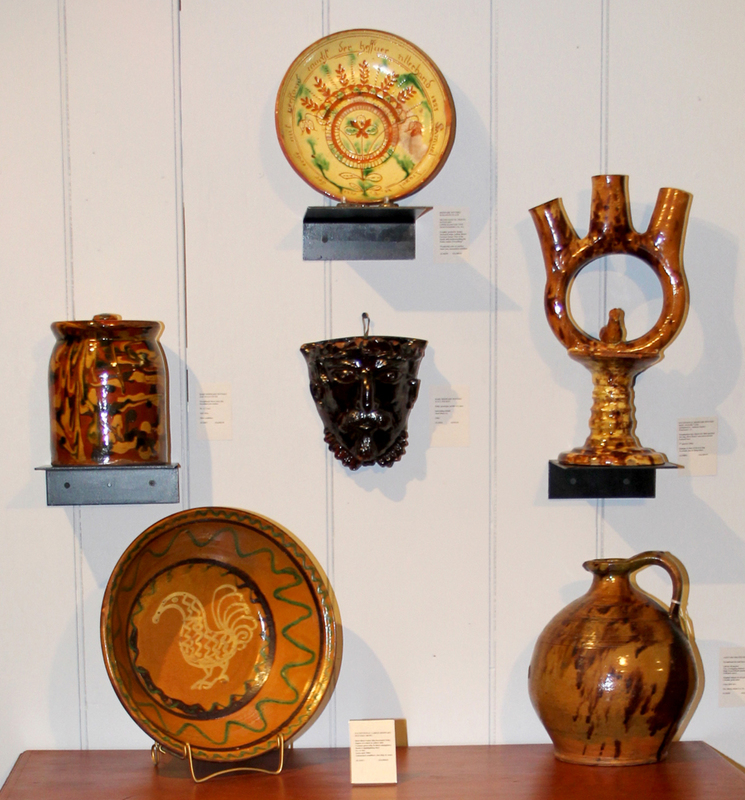 Barbara Israel Garden Antiques, New York city and Katonah, N.Y.
Stephen and Carol Huber, Old Saybrook, Conn.
Greg K. Kramer, Robesonia, Penn. 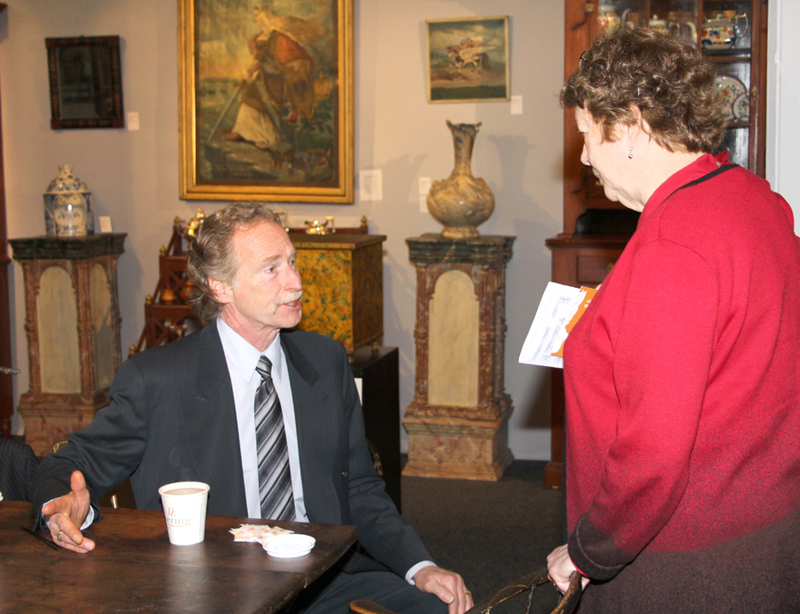 Pennsylvania dealer Greg Kramer chats with a customer. Philadelphia dealer Amy Finkel sold the two major pieces above her mantel. Below left, a fully worked sampler by Hepsy Neal of Stratham, N.H. by, circa 1790. Right, a Salem, Mass., sampler by Peggy Silver, dated 1797. 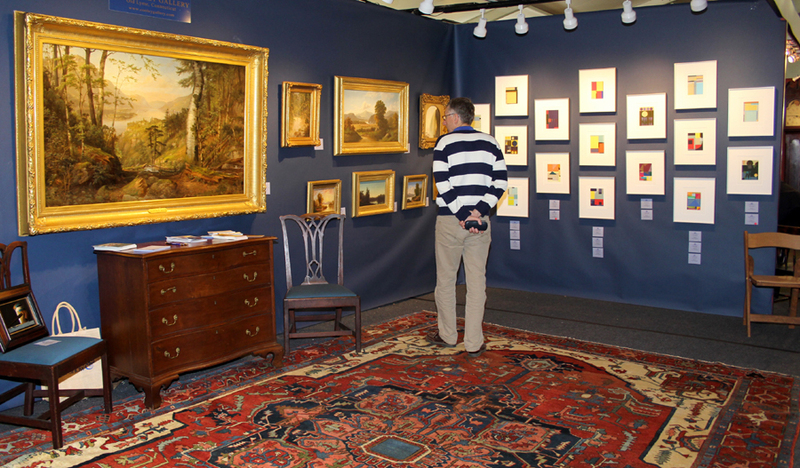 The Cooley Gallery, Old Lyme, Conn., featured Hudson River School canvases on its center wall. Contemporary paintings with paper by Joan Brownstein are right. added a Harnett signature to this J.F. Peto still life. 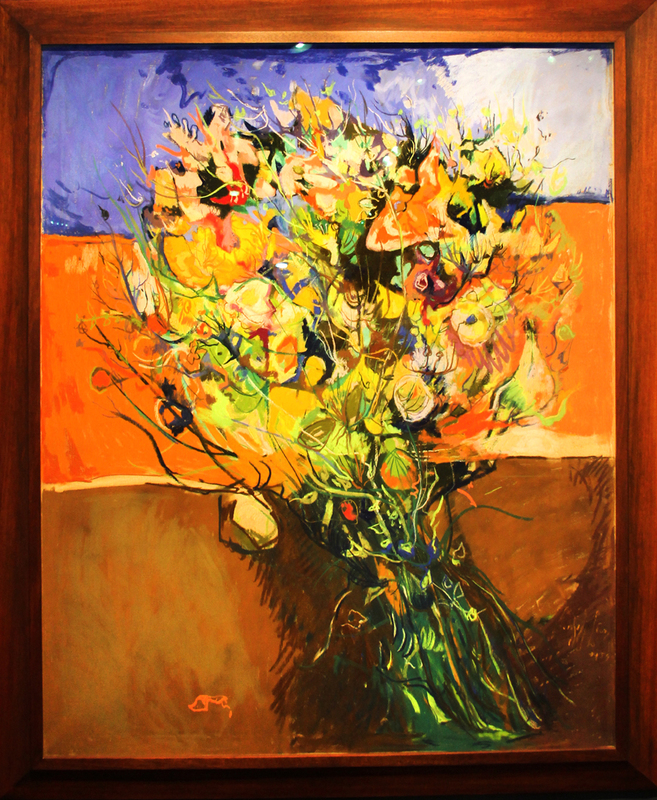 Sumpter Priddy III, Alexandria, Va.
Leon Kelly’s 1950s pastel on canvas "Imaginary Bouquet" was a rare Modern offering by the traditionalist Schwarz Gallery of Philadelphia. Bette and Melvyn Wolf, Flint, Mich.
C.L. Prickett Antiques, Yardley, Penn. A 1959 tea and coffee by Gorham, Providence, R.I..S.J. Shrubsole, New York City.